Culture and Wellbeing York is a group of major arts organisations in York who have developed a cultural menu to help the older residents of York participate in the amazing variety of artistic and cultural events in the city. Reduce loneliness and isolation through developing interests and meeting like-minded people. Improve physical health e.g. dance, singing, performance. Improve mental health through participating in artistic and cultural activities in local communities. Have helped people to make changes in their lives by increasing confidence and providing support where needed. The Cultural Menu may help you try out some activities or events in a safe and supported space. We can talk through concerns you may have and where we can help you try out or join in activity that is of interest to you. It is called cultural prescribing – where you or some else suggests a way of improving your wellbeing by attending or joining in an artistic or cultural activity. Take a look at our activity section below to see what is on offer in York. Both the Arts Council England and City of York Council have developed projects aimed at improving the health and wellbeing of its communities through engagement with arts and culture. The cultural menu is part of a pilot programme developed by City of York Council to help reduce health inequalities as highlighted through its Health and Wellbeing Board. The Cultural Menu is a way in to experience arts and culture for residents who may not be able to participate as much as they would like. See the ‘Join In’ section for our contact details. Volunteering with an arts-based organisation – Many of our organisations have easy access volunteering programmes with a wide variety of projects to suit individuals and families. Some offer a buddy system to help you feel part of the group in a friendly and supportive atmosphere. There are groups you can join at York Castle Museum, Yorkshire Museum, York Art Gallery, Explore York, York Theatre Royal and National Centre for Early Music. Community singing – One of the most popular activities is community singing. We have already worked with 2 choirs to bring community singing to a over 200 people, many of whom had not sung is a group. It has one of the highest satisfaction ratings. Community theatre – You may have seen exciting street theatre in York, from the famous Mystery Plays to the more recent ‘Everything is Possible’ where some of the actual performance takes place on the streets of York. There is a large group within those plays of residents who join in as part of the community theatre. A chance to dress up and see how it feels to be on stage. Tickets – Cost is one of the biggest reasons many people are not able to attend performances are of interest. There is some availability to discounted or free tickets to some events. Access cards are another way to visits galleries time and again. We can help to see if any tickets are available or whether you are eligible for free or reduced costs entry to museums and galleries. Outreach activities – Many of our partners organisations put on special events aimed at those who find it difficult to attend. From the access courses at Converge to the well-established programmes of the York Museums Trust and Explore York – we can find out what you would like to try out and if it is local to you. A helping hand – You know you want to try out a taster but are anxious about going into somewhere new or meeting new people. We can help by visiting with a supporter who can guide through concerns and help to feel comfortable visiting in the future. A friendly face and a helpful journey to ease your worries. Special projects – York has many wonderful artistic and cultural events on offer. In 2018 there is the York Mediale, or you may want to see what iMUSE can do for you. Last year saw two popular community choirs, Cuppa and a Chorus, York in Harmony as well as the ongoing Converge Communitas Choir. The new programme will start at the end of March 2018. If you want to show your interest in any specific activity the email wellbeing@ymt.org.uk with your area of interest and contact details. We may be able to refer you to ongoing activities and events that are already part of York’s cultural and artistic offer. You can also contact the organisations directly. To help us with our work, it would be lovely if you could mention that you were recommended by the Cultural Menu. The major arts organisations have started with the initial cultural menu. We hope to add more organisations and artists to the offer as the service develops with resident participation and feedback. York Museums Trust (YMT)– run York Castle Museum, Yorkshire Museum and York City Art Gallery and manage the city’s internationally renowned collections. National Centre for Early Music (NCEM) – with established educational, volunteer and outreach programme in Walmgate. York Theatre Royal – as well as its famous pantomime the theatre has a track record of successful community participation e.g. ‘Blood and Chocolate’ and ‘Everything is Possible’. Pilot Theatre – Digitally based theatre with work in progress on intergenerational digitally creative programmes in care homes. Recent productions include ‘Blood and Chocolate’ and ‘Everything is Possible’. Accessible Arts & Media (AAM) – Creative media-based charity focused on providing access to those with learning difficulties and dementia using transformative media innovations and services. AAM has developed iMUSE, a highly accessible sensory experience in a supportive environment. Converge, York St John University – provides access to educational, arts and culture activities to those using mental health services in York. Converge runs the Communitas community choir. York Explore – Community Benefit Society running library services in York. There are 16 facilities across the city providing a large geographical and trusted footprint for outreach activity. The programmes of events and activities are for all in the community with some very innovative approaches to reaching out and encouraging participation for all. 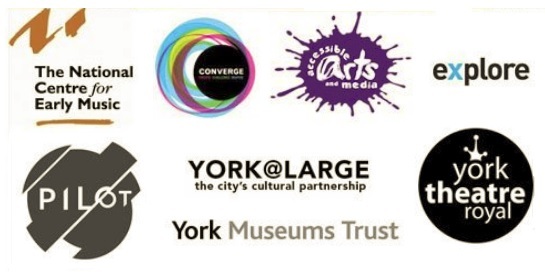 York@Large – the cultural forum for engagement with differing City of York Council departments, enterprise and community groups, making connections and fostering collaboration and ci production. Age UK York – Ongoing partner for current Cultural Menu, working with NCEM to provide their clients with access to community singing. Age UK York are a strategically important and represent the older population with contracts with CYC and York Hospital. Ageing Well Forum at York CVS – Provides a platform for local representation such as York Older People’s Assembly (YOPA) and many specialist community organisations who inform and help to deliver the CYC Ageing Well Strategy. It also includes a very strong public health representation through Healthwatch as the representative NHS feedback organisation. BBC Voluntary Arts North – Voluntary Arts works to promote and increase active participation in creative and cultural activities working closely with BBC Local Radio. We hope to engage with other organisations which have expressed interest in becoming involved in the Cultural Menu – including Health, Dementia, Learning Disabilities, Musical, LGBT and Dance. This pilot project is supported by City of York Council through its work to reduce the health inequalities in its older population an as part of its Health and Wellbeing Strategy. Cultural prescribing is part of a wider approach to improving wellbeing know as social prescribing. Our colleagues at York CVS have worked with the local health service and the council to develop a Social Prescribing service delivered through GP’s surgeries. We are indebted to York CVS for their outstanding support in establishing benchmarking and working closely as referrers to our service.